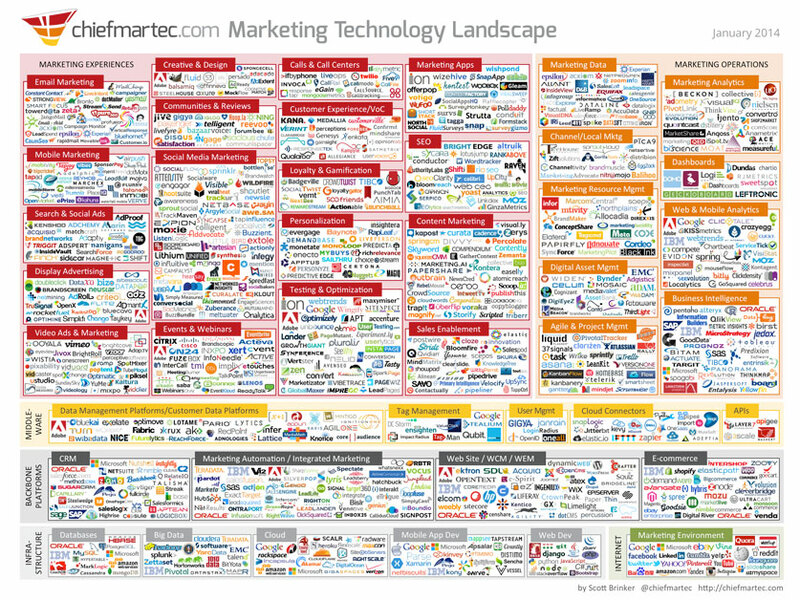 The marketing technology space is growing like a bad weed. Having worked at a marketing tech company and now having a couple as clients, I’ve seen first hand how the space has grown, evolved and fostered competition. Fellow agile marketer and super-smart dude, Scott Brinker, recently put together this supergraphic (seen above) that is overwhelming to say the least. Since 2011 the space has grown ~850% with companies divided into 47 categories and 6 functional classes. To say there are a lot of tech options for marketers these days is a gross understatement. Uncovering solutions your team needs can be daunting and making the wrong decisions can lead to frustration and utter madness. So, how can you make sense of marketing technology? Is the new tool interoperable with our current systems or does it replace our current systems. How involved is training on the new tool relative to the value it provides. Who is going to be in charge internally and how will this impact current responsibilities. These may sound obvious, but different tools have different complexities that come along with them. Implementing a full-blown marketing automation platform like Pardot is much different than signing up for a Sprout Social account. Another thing to consider is the size of your company. Larger businesses with more complex sales cycles, product lines and contacts inherently have more complex processes that technology can hep with. On the flip side, a smaller business with a simple sales cycle, a single product and a small buyer base doesn’t need the bells and whistles, but can benefit from tech, albeit at a much different level. Below are two simple setups †. Mid-sized software company with ~50 employees with a large client and prospect base. In the example above you’ll see six marketing specific tools. On the left we have Pardot, a marketing automation tool that is in charge of segmentation, online forms, nurturing emails and more. Think of Pardot (or any marketing automation tool) as the mother ship where inbound activity lands and outbound activity originates. Each of these tools helps fill the funnel (the thing marketing is in charge of) with exception of Google Analytics – it helps analyze how well the site is doing in aggregate. Each tool is unique and requires a specific set of skills. Knowing how all of these work independently and together is a very important consideration. In the above example, Wistia, Adwords & Analytics all have a direct integration with Pardot for actions and analysis. Sprout Social does not; but will use landing pages generated by Pardot and will lead back to the site, which is all tracked by the mother ship. The takeaway: it’s important to understand how everything works together. The more tools you throw in the pot, the more time and money you’ll need to invest to optimize their usage. In this example, you’ll notice there really isn’t a “mother ship”, rather tools that somewhat work together to accomplish basic tasks. The tools above are free or extremely inexpensive and allow a smaller, less complex business to grow into something more robust. While the tools above are disconnected, they do offer some interoperability. Wufoo integrates with MailChimp and will push form submitters to a contact list, this makes it easy to keep email addresses in one central hub. MailChimp also integrates with Google Analytics and will attach GA campaign parameters to links, allowing a small business owner to see what emails drive traffic. The above example is very basic and assumes the small business is just getting into marketing and doesn’t have a lot of experience with marketing automation or CRM. For smaller companies with a more defined process, all-in-one sales and marketing tools like Hatchbuck or Infusionsoft can a be extremely useful. The feature set is similar to Pardot (email nurturing, online forms, stats etc…) but it includes a CRM for sales. All-in-one tools afford small businesses functionality typically reserved for full blown marketing automation and CRM tools at a fraction of the cost. Whatever your company size or complexity, marketing technology can help. However, wading through the deep waters of the current landscape can be a challenge. When considering adding new tools, it’s important to remember that starting simple and building from there is wise. It gives your team time to master the current tool before adding another. Also, considering the size or your business and how sophisticated your internal processes are can help guide the way. † There are thousands of configurations and hundreds of companies you could choose. I chose companies I like to work with, but any one of them is interchangeable.